The way I discovered “Hello Dolly!” originally was its appearance in the movie “Wall-E”. A few years after seeing that movie, I eventually sat down and watched the 1969 movie version with Barbra Streisand and absolutely fell in love. If you’re a fan of the aesthetic of Main Street U.S.A. or big-style musicals, you too can fall in love with Dolly. The “Hello Dolly!” musical is currently playing at Dr. Phillips Center in Orlando. Photo by Julieta Cervantes. The story follows matchmaker Dolly Levi (Betty Buckley) as she meddles in the life of Yonkers, N.Y. businessman Horace Vandergelder (Lewis J. Stadlen) trying to match him up with herself. She also deflect the pursuits of interested bachelorette Irene (Analisa Leaming) and her employee Minnie (Kristen Hahn) off onto eligible bachelors Cornelius (Nic Rouleau) and Barnaby (Jess LeProtto.) The ensuing hijinks includes all that New York City in the 1800s has to offer, and maybe even some true love. Betty Buckley’s performance is definitely impressive for a 71-year-old. I’ve never seen any of her performances in the past, but I’ve definitely heard her name. Since my first time seeing “Hello Dolly!” was with a younger Barbara Streisand in the role, I was surprised to see Dolly as such an older woman. Thinking about it now, it makes a lot more sense since everyone in the story always talks about how they’ve missed her while she’s been out of New York and how long it’s been. If you’re a fan of Ms. Buckley, you won’t want to miss her in tis role. The music itself is amazing, as in all the productions of this show, but the choreography was absolutely fantastic. The huge amount of spinning and swirling was the perfect way to show off the show’s intricate old-time dresses and suits. Some of the plot points and jokes are a bit dated, but it’s to be expected with a musical written in the ’60s. It’s a beautiful production of a fantastic show. 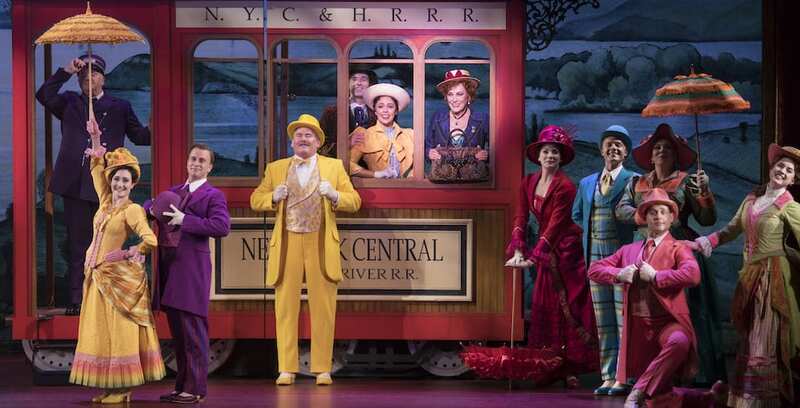 “Hello Dolly!” is at The Dr. Phillips Center for the Performing Arts in Downtown Orlando through Dec. 2. This tour is currently traveling the U.S., you can see where it’s heading next at Hellodollyonbroadway.com. At the Magic Kingdom, and other Main Street U.S.A.’s in Disney Parks around the world, if you listen carefully, you may hear instrumental versions of “Put On Your Sunday Clothes” or “Elegance” as you’re strolling along. They fit with the era represented perfectly.